It’s a Saturday evening, in the middle of March, and it’s snowing. Again. It’s bloody freezing, and I am sat with a hot water bottle on my knee wrapped up in a blanket like a burrito (it hasn’t stopped me indulging in a little mint choc chip ice cream though). Happy St. Patrick’s day too, I’m celebrating by staying in, reading Ragdoll and watching Jessica Jones. I don’t know what you have planned, but my night is most definitely top notch. My housemate Emma, over at The Terror of Knowing, introduced me to a hefty 50 question tag consisting of questions that you probably haven’t been asked before. I also enjoyed Emma Oulton’s video post too, her channel Drinking by my Shelf is too hilarious. Combine these two together and I couldn’t resist jumping on the bandwagon. Yankee Candle’s Island Spa is my all time favourite candle scent, and it’s nigh on impossible to find in the UK! I also adore Christmas scents, anything that reminds me of the festive season. I can bypass pretty much anything floral or sweet though, not my bag. My brain instantly went Kate Beckinsale or Hayley Atwell, and then jumped straight to Maggie Smith. I don’t think I really know. I think, now as I have stopped for a moment, I’d say Shakira. She is stunning, and funny, and clever, and rich, and can speak lots of languages. OK, answering on instinct, and instinct alone, this can’t be someone that I find attractive. So, I’ve narrowed it down to 3 people@ Chris Hardwick, Josh Horowitz, and Neil Patrick Harris. I don’t know, erm, this is hard, are all the questions this hard? Erm, I have no idea. Probably 85? I don’t really understand how you even go about meeting people right at this moment, never mind settling enough to marry. I can be a little bit of a hoarder when I want to be, or can’t be bothered tidying up, but really, I don’t know any hoarders at the moment I don’t think. I’ve been told my Great Grandmother, Aunt(I think? I’m not sure of the exact relation) was a hoarder, but I don’t really remember. Ha. Ha. Ha. Absolutely not. I think I was about 8? I don’t know, but it wasn’t that young. I’m not that great at riding a bike now if I’m honest. I know they say that you never forget how to ride a bike, and I kinda believe that, but I am not a competent bike rider now. That said, I do like a good city cycle tour. Indian, Pacific, and Atlantic definitely. I’ve swam in all of these, most of them more than once. I have paddled in the Southern Ocean too, so I’m counting it because it’s my list. I found this really great website where you can create a map and list of all the countries you have been too. If you split the United Kingdom, then I think it’s 36? Yeah I think that is right. Here’s a list: Antigua and Barbuda, Austria, Australia, Barbados, Belgium, Canada, Switzerland, Czech Republic, Germany, Dominica, Spain, France, United Kingdom, Greece, Croatia, Iceland, Italy, Kenya, Cambodia, Saint Kitts and Nevis, Laos, Malaysia, Netherlands, New Zealand, Portugal, Singapore, Sint Maarten, Thailand, Turkey, United States, Vatican, Vietnam, South Africa, Zambia, Zimbabwe. I’ve known people in the army, and I am pretty sure my Grandad had medals, and other Grandad was in the Merchant Navy. I really love the name Nell and have done for years. I think it is pretty and sweet, and I will fight to the death with Emma to use that name first. At the moment, Alexander is winning, nicknamed Sacha. I failed a few tests, namely Maths and Chemistry. Not something I’m proud of and not something I can escape from either. When I was a really young child I liked Postman Pat. When I was a little older, I loved CBBC shows such as The Queen’s Nose and Jeopardy. The first more adult show I liked was The O.C, which started airing when I was about 12. I literally have no idea, although I remember dressing up as a witch one year so let’s just go with that. I don’t remember loving Hallowe’en (or hating it either) and don’t have too many memories of dressing up really. I have read all of them, actually, I’ve re-read all of them. I’ve also seen the film series of all three too. Harry Potter remains my favourite book series to this day. I want to make it clear that I hate this question. There is no such thing as a ‘British’ or ‘American’ Accent. As a Liverpudlian, I sound nothing like my housemate who is from the North East, and we sound nothing like someone from London. Someone from Brooklyn sounds nothing like a native Texan, and neither sound like a Californian Surfer. That said, I’d rather have a British accent for the purpose of this question. She sure did, she is a (retired) doctor, a General Practitioner (family doctor for the American Folks). So did my Dad, he studied English and History and became a teacher. Sadly, both of my Grandfather’s are dead, and one Grandma is no longer with us, but, when my Grandad’s died, they were both still married to my Grandma and Gran respectively. Nope, not karate, but I did take a few judo lessons in school, and have participated in a few boxing workouts too. Unfortunately, I’m not a fan. Erm, when I was 8 months old my parents took me to California, so it was potentially Disneyland there. Otherwise, I have early memories of going to Disney World in Florida when I was young, as well as Disney Land Paris. I am a big fan of theme parks in general, I love rides and the whole schabang. I’m going to Florida to visit Disneyworld and Universal in October/November. I would love to be fluent in Spanish. I learnt it a little in school, but I have forgotten most of it now. I would love to speak Russian, and Mandarin too, but if it was just one it would be Spanish. I’m English, and it’s grey. Nope. My brother does call my Dad ‘Baldy’, but he isn’t actually bald, he just thinned a bit over the past decade or two. I don’t think so, possibly, I know a lot of twins (brother’s excluded) but I’m not sure I know that I know triplets. If I do, I don’t think I know the set of triplets, maybe just one or two of them. Erm, I’m not a fan of either really, probably The Notebook though. Just. Have I ever tried Indian food? Please?! I live in England, bastardising and eating curry is part of our heritage. I adore Indian food, authentic or not! The best curry I ever had was actually in Malaysia, but I have had a lot of Indian food all over the place. Well, I mean, it depends on how fancy we’re going and what meal we’re eating. In reality I have two. There is a local Italian called Amalia, it serves the best calzone ever and is super friendly, quite cheap, and has a great atmosphere. There there is The Tavern, that serves the meanest breakfast, and brunch. If we’re talking chain restaurant then it’s probably chipotle. I don’t personally but I think my Mum has a Costco card. I’ve certainly been to Costco a few times with her. I have twin brother’s called James Andrew and Jonathan Matthew, so I have to assume that I would be a combination of those names? Erm, my full name is Elizabeth, so really I have been going by a nickname for years. 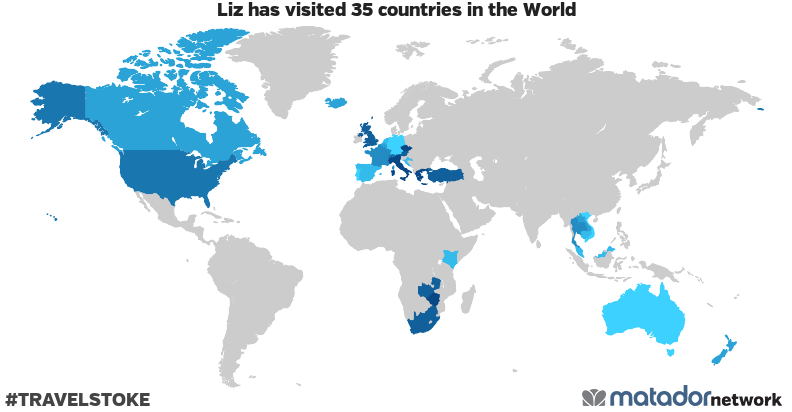 As a child/teenager, I went by Lizzi, but have been called Liz pretty much since I left school. During bar sports matches at University, my nickname was The President (my last name is Whitehouse) but otherwise it’s just Liz or Lizzi. Can I answer me? I’ve had to learn to put up with me for all these years, so I’ve tried to make myself into someone that I can get on with. In truth, I have no idea! 35. Would you rather live in a rural area or in the city? I love the outdoors, forests, water, but I have grown up in Liverpool and I am therefore a city girl at heart. I like the amenities of the city, and having a variety of things on my door step. Yup sure can. I quite enjoy whistling along to songs when I am in the car. Under no circumstances. I like it as dark as I can get it. I get that some people are afraid of the dark, but for me nightlights are for children and children only. I don’t eat as soon as I get up, but most days I have breakfast yeah, unless I get up so close to lunch that it’s not worth it. I don’t really, or certainly none that I am aware of. Oh quite a few times, I’ve had multiple broken bones, gall bladder issues, cracked open my head, never mind all of the sporting injuries that just turned out to be sprains. Yeah I’ve been quite a few times. I have an I quite like it. I don’t like it as much as Finding Dory, but I like it. Currently, I get them from ASDA or Simply Be. They both fit well, and actually pull up properly. I don’t like ones that sit on my hips but rather that stay pulled up to my waist and they currently do the best versions of high waisted jeans. ‘You’re hair looks really nice’ which I get a lot when I make an effort and leave my hair down instead of tying it back. I do quite often remember my dreams. One of my favourite things to do on a lazy morning is regale Emma (my housemate) with my dreams the next morning. 46. What flavour tea do you enjoy? Just normal good old-fashioned English Breakfast Tea. I also quite like Pukka’s detox fennel, cardamon and Aniseed tea too. I have no idea, probably about 20/30? I don’t wear most of them, but i have a variety of boots for the winter, comfy shoes for everyday, sandals for the summer, and then a heap of ‘nice’ or ‘high’ shoes that I wear on special occasions and usually look nicer than they feel to wear. I don’t know. I was brought up as Church of England, but I am not religious really, so I think it would depend if my partner was. I’d probably loosely raise them Christian with a knowledge of all religions and let them decide for themselves. SANTA ISN’T REAL? WHAT? I don’t understand the question. Initially, I set my blog up as a way to keep everyone at home updated while i lived and travelled abroad, and as somewhere to look back on my travel adventures. I really enjoyed it, so branched out into other things I like to talk about, such as books, and have never stopped. If you want to jump on board and take part too, please feel free to answer. I’d love to see what you’d answer. I absolutely loved it too!! It was awesome. Ahaha. The president is an amazing nickname! !